While I’m not a regular Gladwell follower he sounds like he’s tired of social media. In live chats with upset Twitter fans about his disparaging remarks he says things like, “Oy! Save Me.” I don’t want to quote him out of context. His point was that only through some form of social engagement can people truly form meaningful relationships. He asks: “Do you think it is possible for marriages to ever become entirely virtual? Well, no—not unless we considerably water down our definition of a marriage.” Gladwell reminds me of the words of the Joy Division song ‘Love will Tear Us Apart’: “When the routine bites hard and ambitions are low and the resentment rides high but emotions won’t grow”. Can emotions grow on Twitter? Does love only flourish in an environment of trust? Is Twitter a place you can trust people? It seems like you only ever really trust someone if you physically meet them and see how their eyes move (do they keep a steady gaze or avert their eyes?) or how they fiddle with their hands or blush when they are lying about something. Authors like Judith Donath and Dannah Boyd say that, “People trust new information and acquaintances that come to them via people they trust. Thus, one’s display of connections signals one’s trustworthiness.” So on Facebook for example you may trust a stranger’s advice or tip by virtue of their link to a friend you already trust. Twitter is different though, this is not a space where you routinely check out followers and decide whether there is a case for trust or not. Where Facebook ties might be weak Twitter ties are mostly just random. Followers like Jessica456_oregon crawl out the woodwork. While on Facebook those might be your old high school friends, on Twitter they are people you’ve never met and live on different continents. Twitter feels a lot wilder than Facebook; like an ungoverned cowboy territory. Where on Facebook it’s almost impossible to lie about yourself, because your mom and friends will call you out on it, on Twitter you can be anyone. 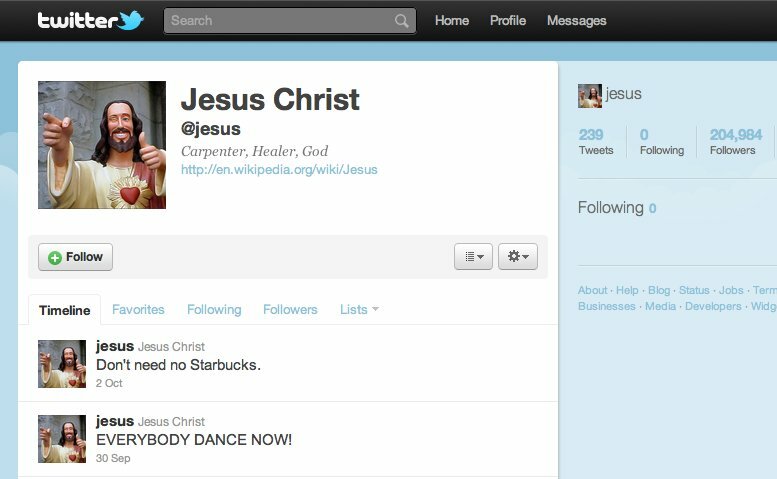 Jesus has 204, 984 followers and tweets: “The bird is the word”. “About to make a triple rainbow.” And my favourite: “I could totally take Yoda.” Returning to Gladwells’ words I started looking for Love on Twitter. Sadly it’s been taken over by a romance novel publisher with a mere 1,642 followers (we’re talking about LOVE!). Love has only tweeted 52 times. That’s a tweet a week for the past year! Happiness fares even worse with only 1,135 followers and on the 24th of September tweeted: “Fruit before noon and no carbs after 4pm”. Jesus: He follows no one. In her research into pace online, UVA PhD candidate Esther Weltevrede compared the freshness of content on Twitter with its relevance. 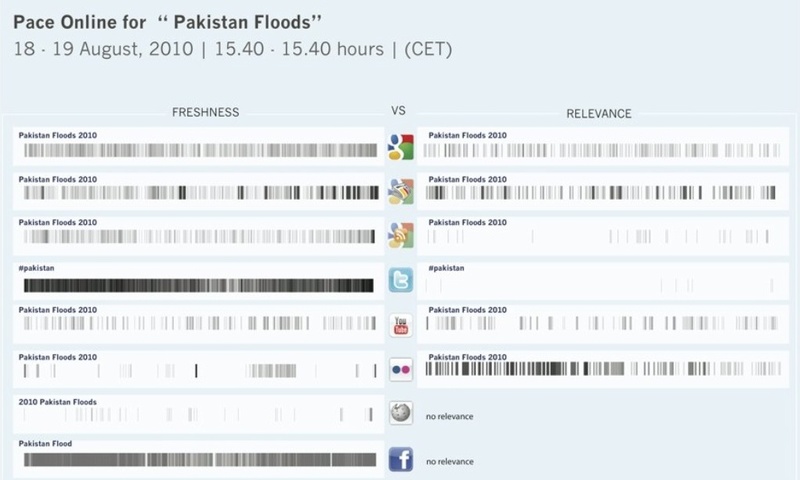 Through a series of a data exercises she mapped the relevance of tweets on a subject (in this case the 2010 Pakistani floods) against other social media platforms and search engines. What she found was that Twitter far outstripped the other mediums in terms of pace. Content was fresh due to its high frequency but when compared to other platforms on relevance it fared particularly badly. Is it a case of quantity but little quality on Twitter? Where can we find more quality on Twitter?